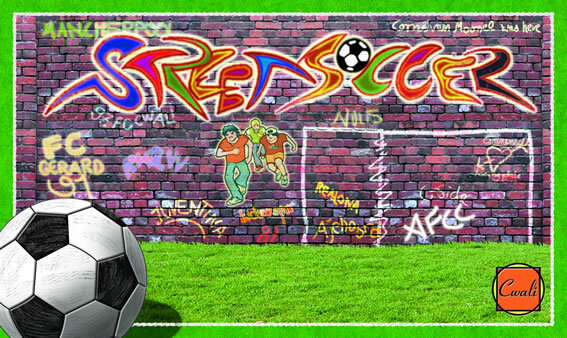 Each StreetSoccer player leads a team and is called "coach" in the rules. Your goalie and 4 outfielders are called "players". A match lasts 25 turns (called "minutes") for both coaches. You have to make more goals than your opponent. Always 1 player only per space. Only the goalie starts in 1 of the 2 spaces in front of his goal. Place at least one player in the centre circle on your own side. You may not start in the centre spaces on your opponent's side. Place at least one other outfielder in your own half and at least one in your opponent's half. Now both coaches roll the die once. The coach who rolls the highest (roll again if it's a tie), moves the ball, starting with his player in the centre circle. You move the ball the number of pips you rolled minus the number of pips your opponent rolled. Only on this first turn, you're not allowed to score a goal. After this turn the other coach takes his first turn (see normal "Turns"). After both turns the first 'minute' has been played. Every turn the dice for a coach will be rolled. The dice are visible below the board. For moving a player and kicking the ball (next 2 sections) the rules are exactly the same for your goalie and outfielders. You move one of your 5 players. Move your player the number of pips on the die (eventually less if you hit the ball). You move your player orthogonally (see figure 1), not diagonally and not onto or through a space with a player already in it. You may change your player's direction after every used pip of the die. You may move on the spaces outside the lines. You may not move back to your starting point. The player has moved 2 spaces forward. To kick the ball your player must reach the space containing the ball. Your player stops in that space. Then you move the ball. You can kick the ball in any direction (including diagonally) (see figure), even the direction your player came from. You move the ball by the unused number of pips on the die + 1 space. The ball follows the chosen direction but can change once from diagonal to straight or from straight to diagonal (see figure), with a 45 degree direction change (a curved pass). The trajectory of the ball may never go through a space occupied by an opponent's player. The ball may reach a space occupied by one of your own players. Then you can kick the ball further in any direction (including another curve), by the unused number of pips on the die + 1 space. So you count the move of the ball further starting with the number that made the ball reach your player (see figures). Players may touch the ball more than once in one turn. You pass the ball via 2 players. Notice that every extra player used makes the ball move one space further. When you have used all pips on the die (you may not use only a part, except when you score a goal), your turn is over. Then the other coach takes his turn and so on. Each time both coaches have played one turn, you shift the black disc one number ('minute') further. To score a goal, the last space before the ball passes the end line must be one of the 2 spaces in front of the goal. The red coach has scored. Notice: You needed less then 5 pips (4) to score, you could have passed directly to the player in front of the goal. The defeated coach places his goalie in one of the two spaces in front of his goal. This goalie brings the ball into play again. You place the ball in the space with your goalie and roll the die. You move the ball, as described under "Kick the Ball", by the number of pips on the die. If you roll a 1, roll again until you roll at least a 2. Notice: as soon as you choose the space where your keeper has to be, you cannot take it back. The board game ends after 25 'minutes' (turns). In case of a tie, the game continues for a maximum of 10 'minutes' (no new kick-off). If you score during these extra turns, then you win immediately (sudden death). If neither team scores again, then the coach who scored the last goal (during the first 25 minutes) wins. If there is no goal during the whole game, then no-one wins. Only the goalie may end his move in one of the 2 spaces in front of his goal. If the ball is in one of these spaces, then other players may kick the ball there, but after playing the ball you shift this player one space towards the opposite goal. If that is impossible, then you shift one space to the nearest sideline. If that is impossible too, then you shift 2 spaces to the other sideline. Only one of your outfielders may stand inside your own penalty area. A coach's move may not result in a string of adjacent players of his or her own color enclosing the ball in an area bounded by itself and fewer than three of the field's borderlines. Also, each team must always have a path, of any length, from at least one of its players to the ball without crossing outside the field's borderlines.